The International Covenant on Economic, Social and Cultural Rights (ICESCR) is one of the nine core United Nations (UN) human rights treaties (seven of which have been ratified by the UK). It forms part of the International Bill of Human Rights alongside the Universal Declaration of Human Rights and the International Covenant on Civil and Political Rights. The UK ratified ICESCR in 1976. The full text of the ICESCR is available on the UN Human Rights website. Each treaty operates on its own unique timetable. We are now in a period of follow-up activity for the ICESCR where we will be working with the government and civil society organisations to implement the Committee's recommendations (‘Concluding Observations’), adopted in 2016. Following the Concluding Observations of July 2016, the Commission is implementing a programme of work to make sure that the UK and devolved governments take concrete action to put into place the changes recommended by the UN. Our work includes engagement with government, Parliament, civil society and other stakeholders. 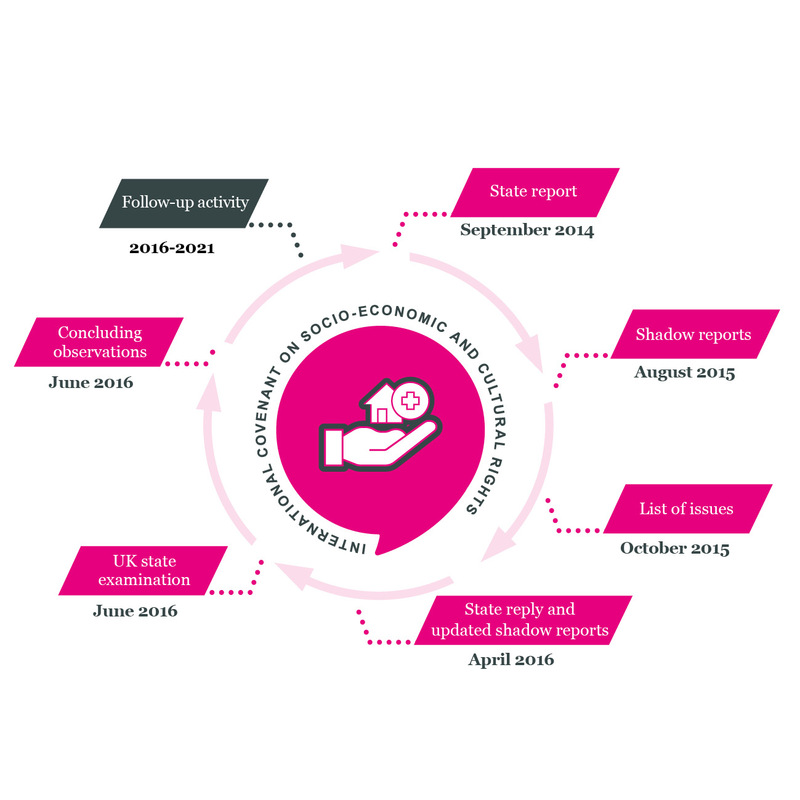 The next state report by the UK Government under ICESCR is due by June 2021. What are the main areas of concern in implementing ICESCR in the UK? any new British Bill of Rights should be aimed at enhancing human rights, particularly economic, social and cultural rights. The UN Special Rapporteurs on Housing, Disabilities, Poverty and Food have written a joint letter to the UK Government on the human rights concerns they have with the Welfare Reform and Work Act 2016 (April 2016). ICESCR is monitored by the UN Committee on Economic, Social and Cultural Rights (UN CESCR), a body made up of 18 independent experts drawn from states that have ratified the treaty. Governments submit reports to this Committee every five years. These ‘state reports’ explain the steps taken to implement the treaty and how these have affected people in the UK. The Committee also considers evidence from other sources. As one of the UK’s National Human Rights Institutions (NHRIs), the Commission submits information to this process in what is known as a ‘shadow report’. The Committee identifies a ‘list of issues’ that they want the states to provide further information on. NHRIs and civil society can also respond to these issues. It then examines the UK’s state report and the responses to the list of issues, and produces its own report with recommendations for action. These are called the ‘Concluding Observations’. States are required to publish these recommendations, act on them and report on progress. More information about this procedure can be found on the UN Human Rights website. Read the UK’s most recent State Report (2014). All documents, including the UN’s Concluding Observations and the shadow reports from the last examination in 2016 can be found on the UN Human Rights website. What does the Committee on Economic, Social and Cultural Rights do? The UN Committee on Economic, Social and Cultural Rights sometimes issues ‘General Comments’ which explain the application of the ICESCR in particular situations and set out the Committee’s interpretation of specific treaty provisions. You can find these General Comments on the UN website.